Thirty years ago I’d just really started to get into punk and new wave and electronic music. 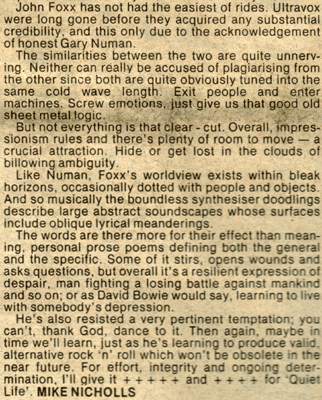 I really liked the music of Gary Numan, who combined all of the above, and I’d read interviews with him in which he mentioned Ultravox as an influence. But I couldn’t find their records anywhere. Meanwhile, a friend at high school had discovered the UK music papers, which had a lot of news about all of this new music we were curious about. The first one I picked up was an issue of Record Mirror — not exactly the most respected of the bunch, I later learned, but it had articles on Kate Bush and the Clash, so it looked worth a shot. It was a combined review of Japan’s Quiet Life and Foxx’s Metamatic, the first I knew of his solo career, and even though the review seems hopelessly vague about the sound of the record, I knew I had to have it. That was 30 years ago. Which is why this post now. 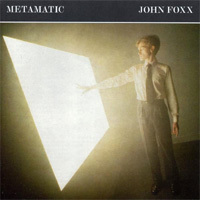 I’ve blathered a lot about Foxx here already, so I won’t go on about Metamatic, and what a brilliant and groundbreaking album it was, and how great it still sounds, and how the whole second disc of bonus material with the last reissue makes it worth buying again. Funny thing… I eventually got into Japan, too, and bought Quiet Life. I love it, but the Roxy Music/disco/Moroder sound of it makes it seem more dated in a way than the relatively primitive synth sounds of Metamatic. They became timeless with Gentlemen Take Polaroids, I think. So, time to get back to business as usual around here. I was looking for a job, and then I found a job, and heaven knows I didn’t have as much spare time as I was used to, which is why the paucity of posts lately. But I think things are getting back in balance. And if not, well, when the contract is up I may be really prolific here.